With Valentine's Day fast approaching, are you searching for that wonderfully romantic way to show your special someone how much you love them? You're in the right place. We have some great suggestions for Valentine's Day at Disney World. With so many fairytale love stories, Disney are the masters of romance. Minnie & Mickey, Cinderella & Prince Charming, Donald & Daisy, Jasmine & Aladdin. And who could forget Clarabelle Cow and Horace Horsecollar? So many great couples have made our hearts soar over the Disney decades. You'll want your Valentine's Day to be romantic and Disney World gives you that in bundles. So let's swan dive into 9 romantic ideas for your Valentine's Day at Disney World. Wine Bar George is a hugely popular restaurant in Disney Springs, we love it there. But did you know you can get a picnic basket? There's a quick service counter located right at the side of Wine Bar George called The Basket. If you spend a minimum of $60 on sandwiches, cookies, small plates, snacks and wine, you'll get a picnic basket for the goodies. The basket includes silverware, wine glasses and a carafe. Pick up your basket, take any of the free Disney boats to one of the resorts, set up your picnic and enjoy. That's exactly what our friend Serena at Living by Disney did with her husband, on behalf of Orlando Date Night. They took the boat from the dock right across from Wine Bar George and headed to Old Key West resort. There are two locations at Disney World where you can take your loved one on a romantic horse-drawn carriage ride. The carriage ride at Disney World's Fort Wilderness Resort takes you along lush pine trails through peaceful natural woodland. Port Orleans Riverside Resort carriage rides take you along the winding picturesque pathway along the Sassagoula River. Sit back together and take in the peace and quiet. After all, who doesn't have dreams of being treated like a prince or a princess at least once? Disney's Boardwalk Resort offers some great romantic activities, including surrey bike rental. Take a slow pedal around Crescent Lake with your significant other. With scenery that will take you back to a bygone era, this experience will be both relaxing and romantic. Follow it up with by sharing a delicious Valentine themed treat from the Boardwalk Bakery. Take a seat on the promenade by the shimmering lake and watch the world go by. If you're at The Boardwalk in the evening, head over to Jelly Rolls for the dueling piano's with a lively atmosphere and fun-filled sing-a-long. It's only open to 21 and over, so there won't be any kids to interrupt your grown up night out. Or get your groove on and dance the night away at the Atlantic Dance Hall. The Art Deco ballroom pumps out music from the 80s right through to modern-day music. Must be 21 and over. Chocolate and romance go hand in hand together. Disney Springs has chocolate in bundles for Valentine's Day at Disney World. It's the perfect place for a romantic stroll. Soak up the atmosphere, watch some live entertainment, sip a cocktail. Then delight in the deliciousness of one of the decadent treats on offer around Disney Springs. For a chocolate sugar rush, pick up some hand dipped chocolate strawberries at Ghiradelli's. And don't forget your complimentary piece of heaven as you enter too. If it's a cool night, warm up with a cup of steaming hot cocoa and marshmallows, wrap up and take a seat overlooking the moonlit water. For cuteness and chocolate combined, head over to The Ganachery. They offer valentines themed romantic treats. You can even watch the chocolate making process or be dazzled with the knowledge of the servers. Are you both lovers of desserts? Be sure to call in to Amorette's Patisserie - you'll be starry-eyed with the dazzling display of deliciousness. Take your pick from the vast array, accompany with coffee, then sit and devour as you gaze into each other eyes. Romantically dribbling chocolate down your chin. Is the love of your life into vintage stuff? If so, this is one treat for Valentine's Day at Disney World they'll adore! Hop aboard an authentic, restored amphicar at Disney Springs. Sit back and relax as your amphicar gently glides into the water. Your captain will take you on a 20 minute guided tour of the waterways around Disney Springs. If you have lunch or dinner at the Boathouse, you'll get $25 off your Amphicar tour. Even if you aren't a vintage buff, the idea of riding in an amphibious car is way cool! Walk up reservations can be made at the Ship's Store next to the Boathouse, or you can call ahead: (407) 939-2628. Disney Springs Amphicar Tours. If you and your significant other are in need of some TLC and pampering, spoil yourselves with a couples spa package. Senses at both Disney's Grand Floridian and Saratoga Springs have packages available. Both are open to off-site guests too. Victoria & Alberts - Grand Floridian Resort: If you're looking for the ultimate intimate dinner, this five-diamond restaurant is the only choice. The exquisite food, superb service and opulent ambiance will place you firmly in the good books for life. Personalized menu's, long-stemmed roses and a harp playing in the background completes the perfect picture of romance. California Grill - Contemporary Resort: Dinner with THE most amazing fireworks as a backdrop? What could be better? Dine at the Contemporary resort and you'll be granted access to the rooftop viewing deck to watch the Magic Kingdom Happily Ever After fireworks spectacular. If you're still dining while the fireworks are shown, you wont miss a thing. The lights dim and the music accompanying the fireworks is piped throughout the restaurant. There will be kids, but you can always ask the concierge if there's a quiet table available. If you dine before or after the fireworks, you'll still get access to the viewing deck. Highway in the Sky Dine Around: This is a dining adventure that takes place in different locations and uses the monorail to transport you from place to place. You'll start at The Wave...of American Flavors at Disney's Contemporary Resort with an appetizer and cocktail. Then you'll hop on the monorail to Disney's Polynesian Resort for some island-inspired nibbles and drinks. Back on the monorail to head over to Grand Floridian for a champagne welcome and an artisanal selection of cheeses or charcuterie. At award-winning Citrico's, you'll enjoy a special Chef’s main course. Finally, the monorail will whisk you back to the Contemporary Resort for an assortment of desserts, cordials and coffee on a private patio. From this exclusive location, you'll have a perfect view of Happily Ever After fireworks to finish your night with a bang. Cost is $170+ tax per person including gratuity. Book well in advance as spots are limited: Highway in The Sky Dine Around. Maria & Enzo's have a Valentines Special Menu. There's a choice of two appetizers, two entrées and a chocolate dessert. 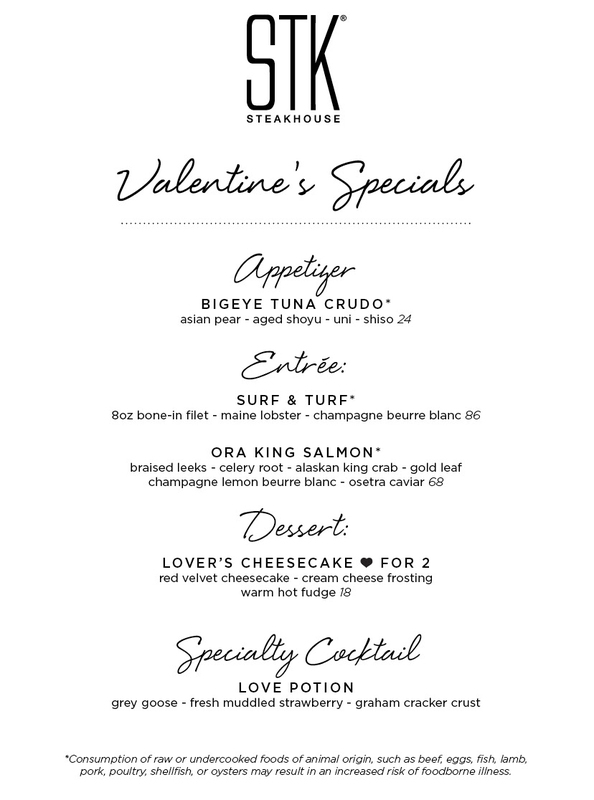 STK also have a special Valentines Menu that includes Lovers Cheesecake for 2 as dessert. Tiffins' - Animal Kingdom: Immerse yourself in an intimate candlelit dinner and you take your taste buds on an exotic culinary journey. The lighting and atmosphere are perfect for a little romance. Enjoy cocktails at the Nomad Lounge or take an after dark safari tour. Hollywood Brown & Derby - Hollywood Studios: Step back in time and enjoy the glamor and glitz of the Golden Age for your special date night. Make your night go with a bang by upgrading to the Fantasmic Dinner Package. Monsieur Paul - Epcot: Fine dining and a glimpse of the fireworks if you time it right. This elegant French restaurant has all the perfect ambiance for that intimate romantic dinner. We loved La Sphère for dessert, watching it melt as the server smothered it with hot chocolate sauce was almost as good as eating it! Stroll around world showcase before or after dinner and enjoy wines from around the world. As with most Disney restaurants, you'll need to book ahead online or call (407) WDW-DINE. With reservations opening up 180 days in advance, many restaurants are fully booked early, but there's often cancellations. If your chosen restaurant is booked, call each day to check. As the place where many learned about love, it's only natural that Disney would have what it takes to make your Valentine's day at Disney World an amazing experience. You can pre-order a special Valentine's Day custom cake and have it delivered to any Disney restaurant. Just call the Cake Hotline 72 hours in advance at 407-827-CAKE (2253). You'll need an advance dining reservation at the restaurant of your choice before you can order a cake. How about A Magical Wish to present to your loved one? This gift boxed silver plated bracelet comes complete with a sparkling wand to make a special wish. The charms on the bracelet read dream, wish and believe. Are chocolates and champagne more your thing? Toast to Happily Ever After includes a choice of beverage with Mickey Mouse keepsake flutes, crackers and cheese and gourmet chocolates. Take to the skies in the world's largest tethered helium balloon. You'll reach heights of over 400ft for a 360 degree birds-eye view overlooking the sprawling Disney Springs. Perfect for couples who love soaring. Each ride lasts about 8 to 10 minutes. Characters in Flight is located at Disney Springs Westside and is open 8.30am to midnight most days, but do check the daily schedule. Groupon often have deals for the flights, so do check. Not a cheap date, but very magical. A romantic cruise for the two with a front row view of the fireworks is the ultimate way to make Valentines day at Disney World go with a bang. Your cruise begins with a slow meander through the waterways to your final destination, with a knowledgeable captain as your tour guide. You'll get insider secrets and Disney insights along the way. Epcot Illuminations Cruise heads to International Gateway and moors up in front of Gateway Bridge for a totally uninterrupted, water level view of the laser show and fireworks. Magic Kingdom Fireworks Cruise gives you a view of the fireworks from Seven Seas Lagoon. There's synchronized sound so you'll feel totally immersed in the magic. There will be juice and soda along with snacks on board, but you can also transform any cruise into a 'Celebration Cruise' with balloons, banners, champagne and strawberries, You can even arrange dinner on board. A 21-foot pontoon starts at $299 plus tax, the 25-foot boat starts at $349 plus tax. If you have other family with you who want to share the special night, the cost is for the boat, not per person. Another special cruise is Ferrytale Fireworks: A Sparkling Dessert Cruise which sets sail from the Ticket & Transportation Center on select nights to view the Happily Ever After fireworks. During Valentines at Disney World, there is a cruise on February 11th and 16th 2018. For full details of all fireworks cruises see: the Disney website. It's easy to see why so many have already made the choice to spend Valentine's Day at Disney World, but if you're staying in one of our vacation homes, you could also plan a cozy night in. Champagne in the hot tub if you're staying in Serendipity. Or snuggle up with chocolates and popcorn for a wonderfully cheesy rom-com on the 70 inch TVs. Did one or more of these dreamyways to spend Valentine's Day at Disney World stand out to you? If so, get planning! Your significant other will love you for it.